As the sun gets lower in the sky on a late summer afternoon at the shore, all is bathed in gold. I love this time of day at the beach, and this is my favorite beach, the first I called home in Delaware over 50 years ago. Although Rehoboth Beach has grown with the influx of Baby Boomers in the last several decades and many of the old store keepers and places I knew in my teens are gone, the town still retains its character. The beach as seen here is in late summer a couple of years after beach replenishment. The dune, covered in grasses that seem to know fall is on its way, is made out of sand dredged from far out at sea and plowed up along the shore to form a barrier to storm tides. In the days when I was a teen the beach was never this large, but neither did it need to accommodate so many people. When a storm takes the beach and artificial dune away, as it inevitably does, it reminds me of the time tested Bible passage cautioning us not to build on sand. Regardless, Rehoboth at this time of day at the end of the season is a wonderful place to be. 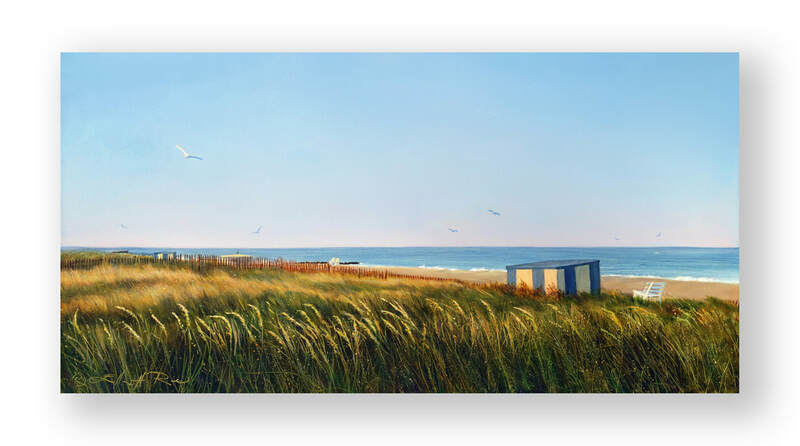 Enjoy a walk through my painting and listen to the call of the gulls, smell the fries and caramel corn, breathe deeply and relax. Moments like this are precious.